This is a traditional recipe and is one of my most favourite dishes. It takes certain amount of time to prepare but it is worth the effort. This curry tastes good with almost everything, be it rice, chapathi, idly, dosa or upma.The chicken can be replaced with minced meat for making mutton kofta curry. First prepare the koftas. For this grind the chicken pieces, onion and coriander leaves into a fine paste (Do not add water). Then remove in a bowl and add all the other ingredients for the kofta and mix well. Set aside. Then heat oil in a pressure cooker and add cardamom and cinnamon. Then add the chopped onions, sauté for some time, then add the garlic paste. Mix well. Then add ginger paste, red chilli powder, and tomato puree. Mix well and cook for about 2 minutes. Then add curd and coconut paste and mix well. There should be no lumps in the gravy. Finally add salt, coriander and mint leaves. Mix well and add 4 cups of water. Bring the gravy to a boil. Then take the kofta mixture, make small balls and drop it in the gravy (The koftas need not be very tough). Once all the koftas have been dropped into the gravy, close the lid of the cooker and cook for 10 minutes. Then open the lid and add lemon juice and bring to a boil. Add salt if necessary. Garnish with coriander leaves. Serve hot with rice or chapathi. 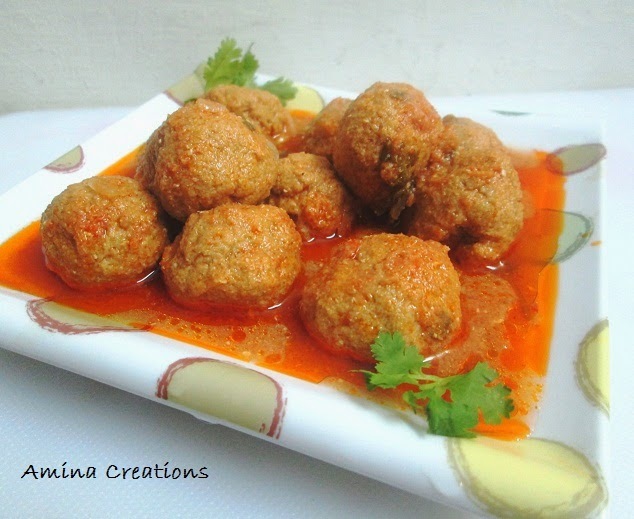 i tried making koftas for the first time ever seeing your blog........ it turned out very well......... All were praising me for the tasty dish... thnxxxxxxxxxx.... keep putting in more recipes.